It’s that time of year again – time for fresh berries! OK, maybe it’s just that time of year again in the midwest which means around here it’s all about the strawberries. And raspberries. And blackberries. Basically right now if it has fresh berries on it, we’re going to eat it. Which is why I am so in LOVE with this naked wedding cake! Sure it might be seriously lacking in the most important component of any cake – frosting! 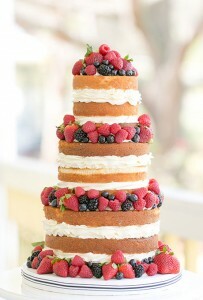 – but each tier is adorned with oodles of fresh, gorgeous strawberries, raspberries, blueberries, and blackberries. And that’s OK with me this summer. Because if there is one thing that makes a summer dessert – in this case a wedding cake – perfect it’s fresh berries. You can find this incredible berry-licious cake here. It was created by The Sugar Suite.